In a bizarre reversal, Hillary Clinton aide Huma Abedin and her sexting-a-holic, jailed husband Anthony Weiner have discontinued their pending divorce case. They claim this was done to protect their 6 year old son. Sorry, but the cynical side of me says this has everything to do with the scandal plagued couple not having to testify against one another, claiming spousal privilege, because of the pending federal probe. They will supposedly settle their separation privately. Who thinks that this is just a stall tactic to put this off until the Hillary Clinton email scandal blows over? Until then, Weiner remains in jail for his part in sexting a 15 year old girl and Huma remains loyal to Hillary. 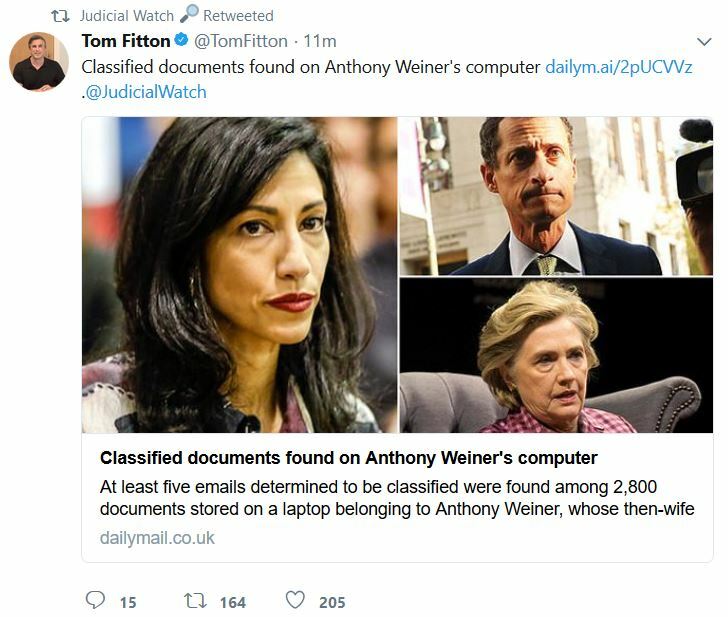 Its not like classified emails saved by Huma were found on Weiner’s laptop after Huma had lied to the FBI that she didn’t do anything to the sort. Oh wait, there was. Identical statements from their lawyers Wednesday cited the scandal-plagued couple’s desire to protect their 6-year-old son by settling outside court — but experts say the real reason could be to shield one another from a potential federal probe. Abedin, 41 — spotted over the weekend sunning herself at the luxury Four Seasons Hotel on Hawaii’s Big Island — was scheduled to appear in Manhattan Supreme Court for a compliance conference in her contested divorce case against Weiner, 53. Instead, one of her attorneys submitted paperwork signed by both parties agreeing to end the case, a court source told The Post. Just how much corruption was there in the Hillary Clinton email investigation? How does the pro-Hillary FBI agent Peter Strzok find his way on both the Hillary Clinton email server investigation and Robert Mueller’s witch hunt? Does anyone really wonder? And why didn’t Mueller inform everyone that one of the key investigators had such a conflict of interest? Mueller has a HUGE credibility problem. Mueller already had conflicts of interest in this investigation. Now it would seem impossible how this investigation could ever be impartial or credible. It was a witch hunt from the outset.